Posted on April 11, 2006 by Chad O. There are a couple of articles about a “Fujitsu LOOX P705 or P70S” Tablet PC that came out today, but I’ve spent some time looking into it, and what is on Fujitu’s site is information about a Fujitsu LOOX or Loox P70R. This only comes in one color (one of the articles talking about this mentioned nine colors, however that was a reference to their T series). The P70R is an 8.9-inch widescreen laptop powered by a Pentium M Ultra Low Voltage (ULV) 1.2GHz CPU and has up to 1GB of memory. 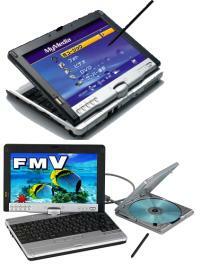 It converts into a Tablet PC and runs Microsoft Windows XP Tablet PC Edition 2005. It’s very close to the P1510D and is either a sequel (the P70R appears to have been announced after December of 2005) or is the Japanese model number of the P1510D. I would have a hard-time believing it’s the same as the P1510D, because the P1510D has received so many glowing reviews, I would think they would mention it on the P70R product page. The fact that model numbers change between countries confuses things as well. I’ll look into this some more, as I’m curious about the T-series as well (we’ve mentioned the LOOX T70M in the past) and while some of the specifications are different (the T70M has a larger display and does not convert into a Tablet PC the way the P1510D/P70R does) they are different lines. Update: Akihabara is reporting this as the Loox P70S. This entry was posted in Announcements, Fujitsu, Tablets. Bookmark the permalink.